Situated on Cluntergate, Nether Hall, a timber frame building that was originally a private house, which may owe much of its existence today to the fact that it became a public house in the mid 19th Century. Extensive and sympathetic renovation was undertaken in 1964/65 by Scottish and Newcastle Brewery Ltd. with an eye to retaining the character and features of the property after they purchased the Shepherd's Arms in a dilapidated state from London resident and owner Captain Battye. Above: The Shepherds Arms, Cluntergate, Horbury. Photograph is courtesy of Amelia Joy January 2010. "The house occupied by William Hoycard on the west of Cluntergate adjoining the late Mr. John Scholefield’s house in Hall Croft bore the name Nether Hall. It was evidently one of the best houses here having fronted to the east with two low gables and a central space, and having had many outbuildings and land about it. It is not well built, nor, though generally wainscotted, well finished; but it has a plaster ceiling, dated 1593, ornamented with fleur-de-lys and the workman’s pattern of Queen Elizabeth’s arms and her initials E.R. like ceilings at Wakefield and Carlton. On a chamber cornice, apparently of later date than the ceiling are the words "Love Vertve And Learninge. Hate Vice And Ignorance E.B. A.B." Over the front door are the initials and date T.S.S 1757. This was the house of the Binnes family, and probably the initials on the cornice are those of a husband and wife of this name. The initials and date over the front door are those of Timothy Scholefield and Sarah his wife, before marriage Sarah Maude of Horbury who were married in 1749, he being then described as Ossett-street-side, gentleman, Seven years afterwards Mr Timothy Scholefield purchased part of Nether Hall from Mr James Allott and his son, and then put up his own and his wife’s initials as we see." Helpfully, W.S. Banks adds that the above mentioned Mr Timothy Scholefield was not related to a later owner of Nether Hall, Mr. John Scholefield, who is recorded below. 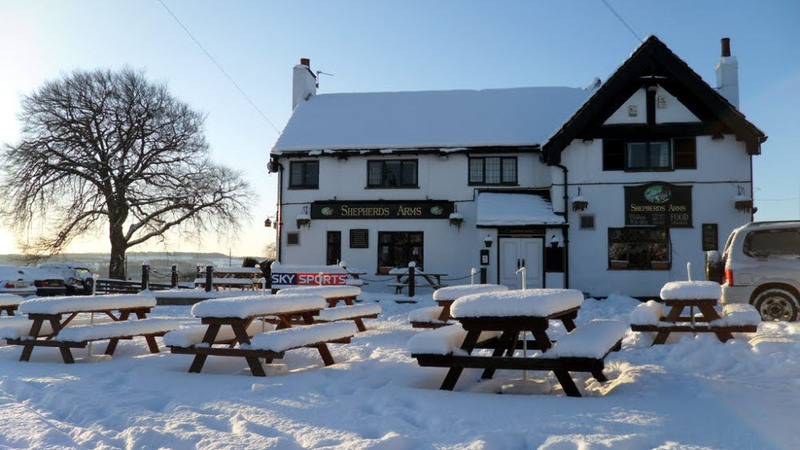 The Shepherds Arms dates back to the 16th century and was originally called Nether Hall. Inside the main building of the Shepherds Arms, there remains some evidence of a small, timber-framed building dated 1538. Historical records show that the building was originally much larger than it is today and at one time was divided up into two individual dwellings, part of which was an inn. The earliest known owners were the Binnes family who lived there circa 1600. Jonas Binnes had a will dated 25th April 1623 and he held land at Horbury, Crigglestone and Durkar as well as other parts of Yorkshire. A Wakefield apothecary, Lawrence Horrocks bought Nether Hall from the Binnes family and he in turn passed it on to his son, Cambridge draper, Lawrence Horrocks. John Scholefield (1760-1850) a Horbury Attorney at Law and substantial landowner subsequently acquired Nether Hall and, on his death, left it, and other Horbury lands and properties, to his married daughter Margaret Battye. Shortly afterwards Mrs Battye had the Hall altered into a public house and in a survey in 1857 it was referred to as "The Shepherds Arms Beer House" More can be seen about the Scholefield and Battye families on the Horbury Hall page of this website. It is recorded that in 1790, John Binns of Horbury occupied part of the building and he was referred to as an "innkeeper." On the 1857 Horbury Tithe Award, the building is now referred to as the "Shepherd's Arms, beerhouse and brew house" and the tenant was then William Hoycard. By the early 1900s, the Ripley family were the tenants of the Shepherd's Arms and Berry Ripley was the landlord in 1902. In fact, three generations of the Ripley family were the tenants of the Shepherd's Arms over a long period of around 80 years. Berry Ripley died in the Spring of 1926, aged only 48 years. Berry Ripley's widow, Harriet (nee Broome) whom he had married in 1904 became the licensee of the Shepherd's Arms shortly after his death. In early 1944, Mr. Fred Woodhall junior and his wife Jenny managed the Shepherd's Arms for the then licensee, Mr. Fred Ripley. Later that year, the license was taken over by Mr. Fred Woodhall senior and he held the licence until 1956. Prior to the 1960s, the Shepherd's Arms was a free house, which sold Tadcaster Tower and Younger's Ales. The "Yorkshire Evening Post" of 15th August 1950 carried the following rather short and cryptic note regarding the forthcoming demise of the Shepherd’s Arms. "The Shepherd's Arms, Horbury's 16th century inn is to be pulled down as soon as a licence can be obtained to build another inn on the site." The demise of the Shepherd’s Arms was, fortunately, much exaggerated and in the mid 1960s extensive restoration work was undertaken. This included the removal of the bar fittings and the Dickensian pine seating which were donated to Wakefield Museum. During the restoration the workmen’s circular saws frequently broke on the fossilised timbers and the mortar rendering on some of the interior walls was bound with straw. An old outhouse was demolished and its thick walls disturbed the skeleton of a cat in the cavity between the inner and outer walls, where there was no apparent access. Better news came from the "Yorkshire Evening Post" three years later on 2nd November 1953 when it was reported that Mr Fred Woodhall, licensee of the The Shepherd’s Arms, had been presented with a clock in appreciation of his service to the Horbury British Legion. The report continued by adding that in 1916 Corporal Fred Woodhall of 4th KOYLI, was reported missing, believed killed in France, and shortly afterwards his wife was notified by a War Office telegram that her husband was dead. Mrs Woodhall subsequently received a card from a British soldier in a German P.O.W. Hospital saying that her husband was in the same hospital. He had been severely wounded on the Somme with bullet and shrapnel wounds in the legs, arms and shoulders and, while he was a prisoner, his left leg had been amputated. In 1956, after Fred Woodhall senior retired, his son Fred Woodhall junior took over as landlord of the Shepherd's Arms, holding the license until 1964. From 1944, Beverley's, Melbourne and Younger's ales were sold in the pub, but in 1959 a license was successfully applied for granting the sale of spirits as well as beer. Previous to 1959, the Shepherd's Arms was licensed only to sell beer. 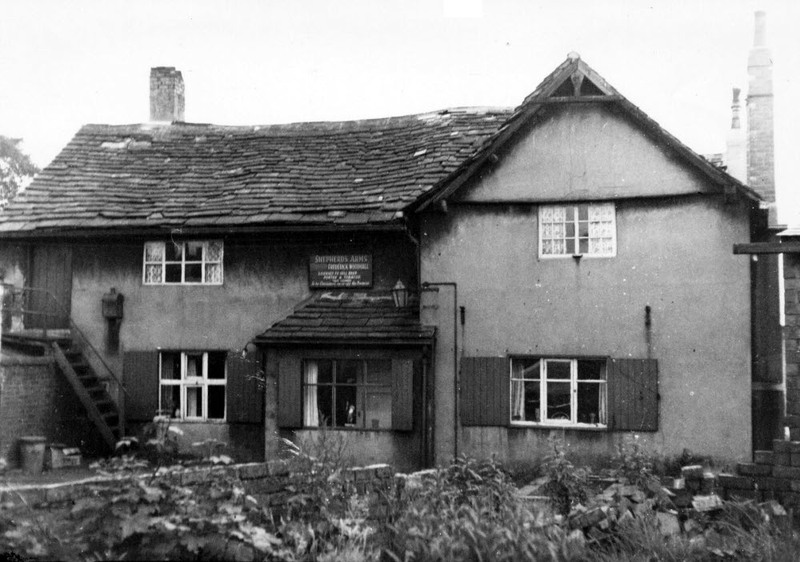 Above: A 1964 picture of the Shepherds Arms, Horbury before modernisation. Before the restoration of the building in 1964/65, the initials STS 1757 could be seen on the lintel above the front door. These were the initials of Timothy and Sarah Scholefield, who married in 1749 and purchased part of Nether Hall in 1757. 1. "Bartlett's Wakefield and Horbury - The collected local histories of Kenneth Smith Bartlett", CD published by Museum Digitisation Service, edited by Phil Judkins, MA, MSc, FCIPD, FRSA. 2. Research notes by Alan Howe, Ossett, April 2016.